Rev. 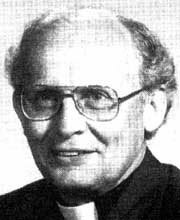 Dr. Berard L. Marthaler (1927-2014) is a professed member of the Louisville Province (Our Lady of Consolation) of the Order of Friars Minor Conventual (OFM Conv.). He taught at The Catholic University of America from 1963-1997. He is known as a meticulous historian, for his work in catechetics, for his leadership in developing catechetical directories and commentaries for the Roman Catholic Church and as long-time editor of the national catechetical journal, The Living Light. Berard Marthaler was born May 1, 1927 in Chicago Heights, Illinois, the oldest of four children of Joseph and Francis Marthaler. He was baptized Lawrence but was given the name Berard when he entered the Franciscan novitiate in 1946. His mother was of Irish descent and his father had a German background. The middle class family were strong Catholics who survived the Depression, though his father was out of work for a time. Chicago Heights was a suburb of Chicago near the Indiana border, part of the "rust belt" with lots of railroads and industry. He attended parochial school and served as an acolyte. He recalled that his mother kept asking him what he wanted to do with his life and eventually he told her he wanted to be a priest. Berard went to a boarding high school in Southern Indiana from 1941-1945. He then went to the novitiate. Berard's pastor was a Franciscan and led him to that order. He attended Our Lady of Carey Seminary in Carey, Ohio from 1946-48. After World War II there was a drive to get students to go to Rome so he went in 1948 to study for ordination and dogmatic theology at the Pontificia Facoltá di S. Bonaventure (Seraphicum, Rome) from 1948-53. He was ordained in Rome on March 29, 1952. Berard earned the S.T.D. at Seraphicum, and his doctoral dissertation was entitled Original Justice and Sanctifying Grace in the Writings of St. Bonaventure. When he returned to the States, he was assigned to teach in Minnesota at Assumption Seminary. He took graduate courses at the University of Minnesota in history, eventually earning a master's degree and a Ph.D. in Ancient History. During this time he got involved in the study of coins and received a grant from the American Numismatic Association to go to Turkey for a year in 1960, where he did research for his doctoral dissertation. His dissertation was entitled, Two Studies in the Greek Imperial Coinage of Asia Minor. Dr. Marthaler served as an instructor in Church History at the Assumption Seminary and as a lecturer at St. Richard's School of Adult Education in Minnesota. He also taught at Ursuline College in Louisville. He was appointed Assistant Professor at Bellarmine College in Louisville, Kentucky in 1961. In 1963 he moved to Washington, DC to become an Assistant Professor of Religion and Religious Education at The Catholic University of America, where he served for 34 years. Berard Marthaler did not start out in the field of catechetics, but as a historical theologian. Yet, as stated by Mary Collins, a colleague at Catholic University, catechetics "claimed him" through a friendship with noted religious educator Mary Charles Bryce (Dooley and Collins, 1997, p. 12). In a videotaped interview provided by the Department of Religious Education at CUA, Marthaler stated that he was trained as a church historian but he found himself the administrator of the graduate program having to justify and defend what they were doing. So he "read himself into the field" under the tutelage of Mary Charles Bryce. He recounted the story of how he came to CUA in September of 1963. While he was teaching at Bellarmine, he was giving weekly instruction to a young woman who wanted to enter the church. After her baptism in the spring of 1963 Berard was exploring her future with her, when she expressed an interest in studying theology. He had to tell her that there was no room for women in theology in the Catholic Church. The young woman, however, persuaded Berard to look into it, and so he phoned a friend of his who told him that several programs for lay folk in theology were cropping up and one was at The Catholic University. Berard passed the information along to the woman and she applied. At a meeting of the Catholic Theological Society, Berard was to meet with Gerard Sloyan, head of the Department at CUA on behalf of this woman he was mentoring. What he thought was to be a recommendation for a student turned out to be a job interview. For his first two years at CUA Marthaler taught church history and theological themes in church history, mostly in the undergraduate school. At that time Vatican II was in full swing. According to Father Marthaler, there was a development on the horizon forcing a new look at the sources and methods of theology and biblical studies, as well as a burgeoning liturgical movement in the church. (Kennedy, 1994) People were ready for a change. Vatican II was extensively covered in the popular press and opened up possibilities for a whole new approach. Many persons, especially those in religious orders saw CUA as a place to come to explore these new developments. The department started a summer program for professionals and diocesan leaders that had great appeal. Berard attributed the appeal to the quality (some of the most renowned biblical scholars and theologians came to teach) and to their willingness to mediate the changes blowing through the church in the spirit of the second Vatican Council. In 1967 Berard Marthaler was named an Associate Professor and became head of the graduate Department of Religious Education succeeding Sloyan who left for a position at Temple University. In July of 1968 Berard Marthaler was one of thirty scholars who signed a protest against the papal encyclical on birth control, Humanae Vitae. This act of conscience caused some political fallout for him, but he was able to maintain good relations with the church and the academy. The University underwent a reorganization and the department of Religious Education became the Department of Religion and Religious Education in 1969. Marthaler served as department head until 1972 and then again from 1974-1984. In 1972 he succeeded Mary Perkins Ryan as executive editor of The Living Light, a journal published by the Department of Education of the United States Conference of Catholic Bishops (USCCB). Pope John Paul II awarded Berard Marthaler the Benemerenti Medal in 1988 for twenty-five years of distinguished service at The Catholic University of America. In 1990 Dr. Marthaler was named Warren-Blanding Professor of Religion at CUA. He retired in 1997. Father Marthaler has received many honors (see list of professional activities below) and participated in many significant conferences and consultations on catechetics, activities that he continues in retirement. On December 10, 2002 the School of Religious Studies was reorganized as the School of Theology and Religious Studies. Instead of being organized in departments, the School will offer ten Academic Areas of study with various degree programs. Berard's lengthy and momentous contribution was commended at a celebration of the new school in 2003. Berard Marthaler came to play an extensive role in the twentieth century catechetical renewal in the Roman Catholic Church. According to Anne Marie Mongoven, who wrote about the catechetical development, catechesis had long been associated mostly with children (Dooley and Collins, 1997, p. 131). Several church documents coming out of the Second Vatican Council and the interpretive work of several key scholars brought about a new way of looking at the catechetical task of the church. Berard Marthaler was among them. He wrote about the change in the image of catechesis in a chapter, "Catechesis Isn't Just for Children Anymore" in Theological Education in the Catholic Tradition: Contemporary Challenges, edited by Patrick W. Carey and Earl C. Muller. Father Marthaler noted that although catechesis has always been important in the Catholic tradition, it came to be regarded as child's play, women's work and associated with "scissors and paste theology." Though he would downplay his role in the shift, Marthaler was instrumental in the catechetical revival in the church. The Second Vatican Council addressed the need for a new look at catechetics which until then had mostly focused on the Baltimore Catechism, which children were taught beginning around age seven. Some bishops argued that a uniform catechism appropriate for the whole church would be impossible and favored a catechetical directory instead. Thus the General Catechetical Directory of 1971 was produced by the Sacred Congregation for the Clergy. Its purpose was to present guidelines and principles for catechesis. As opposed to a catechism intended for the instruction of children, the General Catechetical Directory focused on catechesis for adults and was intended for bishops and parish catechetical leaders. Berard later argued in 1987 in an article entitled "Catechetical Directory or Catechism? The Wrong Question" in Church that a directory does not rule out a catechism, but that any catechesis should follow the guidelines of the General Catechetical Directory. Yet, he had been concerned along with other theologians about a universal catechism given the diversity of the Catholic Church. When a vacuum exists, someone or something usually steps in to fill it. The Reverend Professor Berard L. Marthaler-historian, theologian, and catechetical scholar- was largely responsible for educating the United States Catholic Church about the General Catechetical Directory (Dooley and Collins, 1997, p. 136). Berard wrote an article for The Living Light on "The Origin, Context and Purpose of the Directory," and soon after, his book, Catechetics in Context: Notes and Commentary on the General Catechetical Directory was published (1973). This book provided an explanation of the theology present in the Directory that would be accessible and useful for those engaged in parish catechesis in the U.S. The United States Catholic bishops devised a plan for introducing the General Catechetical Directory to America which evolved into the document, Sharing the Light of Faith: National Catechetical Directory for Catholics of the U.S. Berard Marthaler's commentary on this document was published in 1981. In the commentary Berard stressed catechesis as a form of the ministry of the word and in close relationship to evangelism, liturgy and the kergyma. Mongoven calls these directories and commentaries "foundational" in the twentieth century catechetical renewal (Dooley and Collins, 1997, p. 141). The 1960s, however, brought opposition to what some detractors called the "new catechetics" because it was said to confront orthodoxy and water down the teachings of the church in a time of social upheaval when clarity was especially needed. Part of the controversy may have been due to some American Catholic scholars, Berard Marthaler among them, calling for open discussion on moral issues. Even so, the directories and Marthaler's leadership in interpreting them to the larger faith community had lasting impact. He was a leading proponent of the socialization model of catechetics as evidenced in a chapter he wrote for a volume edited by Padraic O'Hare entitled, Foundations of Religious Education. Here he staked out an understanding of religious education as formation within a community of faith and as the responsibility of the entire Christian community. Marthaler connected socialization with the model of Christian nurture offered by Horace Bushnell, but going further, he understood catechesis to be a life-long process of handing on the wisdom of the tradition. Bishops of the church consulted Berard regularly throughout the process of developing the directories and later the Catechism of the Catholic Church, according to Mary Collins. Berard was one of several Catholic scholars who debated the 1985 Synod's decision to commission a catechism, published in issues of Concilium. Berard describes the attempts by bishops to prevent the multiplication of catechism, the rise of national catechisms following Vatican I and the Roman critiques of recent catechisms. His book, The Catechism Yesterday and Today: The Evolution of a Genre thoroughly recalls the history leading up to the Catechism of the Catholic Church, which was finally published in 1992 in French and in English in 1994. He traced the history of the catechism back to Vatican I which wanted a catechism for children modeled on the Small Catechism of Robert Bellarmine. The new catechism was envisaged as a work for mature readers. In 1986 Berard wrote The Creed, a book that traces the history of and delves into the meanings of the Nicene and Apostles' Creeds relating them to contemporary theological issues. This seminal work is an effort to clarify social and cultural factors in the development of the creeds in order to perpetuate ecumenism. It was, he wrote, a "witness to my own confession of faith" (Marthaler, 1987, ix.). He dedicated The Creed to his former students who, he wrote, "have taught me a great deal about theology, about ritual, about religious education, about church and, most important, about faith" (Marthaler, 1987, p. ix). For the American Catholic community, Berard was the single most influential religious educator shaping 'official' religious education policies and practices in the post Vatican II church. Moreover, as an historical theologian, Berard was a bridge between the catechetical and the theological communities, helping both to better understand their historical roles in the educational mission of the church. Berard Marthaler is also remembered for his leadership in theological education. As head of the Department of Religious Education he advocated curricular changes that reflected the shift in Catholic education from having evangelism, catechesis and apologetics as its primary purpose to a more in-depth, intellectual study of religion. He brought in interdisciplinary, ecumenical and interreligious aspects which according to his colleague, Catherine Dooley, were a real innovation and prophetic vision. It was not the classic, neoscholastic approach to theology, but an attempt to understand what theology has to say about contemporary issues and culture. In her dissertation on The Changing Concepts of College Theology: A Case Study, Sister Rosemary Rodgers inferred that Berard affirmed the value of the Catholic tradition and defended its place in the university, while at the same time opening a window to the freshness of other religious traditions. Under Father Marthaler's leadership the curriculum attempted to respond to the questioning attitudes of the 60s and 70s and aimed at recovering meaning in the tradition in light of cultural developments. Courses in phenomenology of religion, Protestant thought, Eastern religions and the Black religious experience were added. Marthaler and a colleague, William Cenkner argued that religion courses should continue to be required of undergraduates at CUA because the college is not content only to teach professionals information and skills, but a sense of values as well. Additionally, they argued, religion is a part of life and important for understanding humanity. In their 1968 Joint Faculty Report they wrote: The scholar may reject organized religion, but he must account for the prominence it has had in human history. (Rodgers, 282-283). Marthaler was a persistent proponent for the study of religion as distinct from the study of theology on the rationale that this approach dealt with questions raised in Vatican II's constitution on The Church in the Modern World. Another significant change near the end of his stint as department head was the acceptance of master's level work from other institutions toward the Ph.D. Formerly, students were required to take The Catholic University of America's MA degree on the way to the Ph.D., which some faculty felt was elitist. The department then got more doctoral students from diverse backgrounds, which meant that the program had to have a more pluralistic approach. For more than thirty years he has sought after and published the work of renowned scholars in The Living Light and gives new scholars an opportunity to publish their work as well. Marthaler regularly writes the Editor's Foreword and (since 1985) "What They Are Saying," a survey of current publications concerning issues of interest to professional religious educators. This ecumenical journal continues to provocatively address timely issues in catechetical leadership. Berard was one of the first Roman Catholic members of the Association of Professors and Researchers in Religious Education (APRRE) and also served as its first Roman Catholic President. A volume entitled The Echo Within: Emerging Issues in Religious Education, edited by Catherine Dooley and Mary Collins, was published in 1997 to honor Berard upon his seventieth birthday and retirement from CUA. This tribute to him, quoted here, contains a dozen essays exploring issues in catechetics that were his passion. His colleague, Mary Collins eloquently describes Berard's unique gift: Berard Marthaler established a reputation for always thinking ahead, missing nothing, making connections among the disciplines. He continues to be notorious for carefully attending to inchoate ideas voiced in seminars, in corridors, at lunch tables, at podiums, platforms, around conference tables, in offices. Prodding people to move their good ideas from inception to text has been one of his editorial strengths…he has promoted critical thinking about the church's task of handing on the faith in an ecumenical age (Dooley and Collins, 1997, p. 12). Several dissertations deal with Marthaler's work, including Rosemary Rogers' mentioned above and Maura Thompson Hagarty's The Role of 'Experience' in Religious Education/catechesis in the United States since the Second Vatican Council (Catholic University of America, 2000) and Ruth L. Poochigian's A Critical Analysis of Selected Roman Catholic Religious Education Theorists from the Perspective of Adult Education Research and Theory (University of Wisconsin, 1986). As a teacher he made history come alive, and made the past present in the telling of a good story, the lesser-known side of things. He always calls his students to greater heights of knowledge. He is fluent in the languages of lay folk and the erudite and of Protestants and Catholics. Former students who have gone on to make significant contributions in the field include Catherine Dooley, Ann Marie Mongoven, Michael Warren, Marianne Sawicki and Robin Maas. In a telephone interview Marianne Sawicki said, "When I entered the graduate program at Catholic University Berard represented all I wanted to be intellectually and as a human being. He was practical and smart." She recalled that he would often begin class with a story to arrest one's attention. Robin Maas, founder of Angelus Academy and former dean of the John Paul II Institute on Marriage and Family Studies and former professor at Wesley Theological Seminary, called Berard a "superb mentor". She writes, "He did not insist that I conform my own work to fit his agenda." She counts it as a great blessing that Berard came into her life when he did. He introduced his students into professional guilds and helped them find jobs. Even in retirement Berard Marthaler has made major contributions, including serving as chief editor for the revised edition of the New Catholic Encyclopedia which consists of fifteen volumes and 12,000 articles from more than 4000 scholars on most every important Catholic topic in theology, ethics, liturgy and worship and cultural trends. Mentor, astute critic and sage, Berard Marthaler continues to prod and challenge us with grace and humor. Addendum: Friar Berard Marthaler, OFM Conv. passed away November 30, 2014 in Lanham, Maryland. Curriculum Vitae for Berard L. Marthaler. Information provided in e-mail correspondences with Berard L. Marthaler, October 19, 2002 and Nov. 20, 2002. Interview with Father Marthaler: History of the Department of Religion and Religious Education. Unpublished video, The Catholic University of America, 2002. 1999 APRRE General Business Meeting Minutes. Toronto, Canada. Dooley, C. & Collins, M. (Eds.). (1997). The echo within: Emerging issues in religious education. Allen, TX: Thomas Moore. Kennedy, William Bean (1992-1997). Religious educators oral history: Religious education history in the twentieth century in the United States. Volume 6. Marthaler, B. (1987). The Creed. Mystic, CN: Twenty-Third Publications. Mills, W.E. (Ed.). (1988). Council of Societies for the Study of Religion directory of faculty, of departments and programs of religious studies in North America. Reese, T. (1991). Bibliographical essay on the catechism for the universal church. The Living Light, 27 (Winter), 151-57. Rogers, R. (1973). The changing concept of college theology: A case study (Doctoral dissertation, The Catholic University, 1973). Marthaler, B. (1973). Catechetics in context: Notes and commentary on the General Catechetical Directory issued by the Sacred Congregation for the Clergy. Huntington, IN: Our Sunday Visitor. _____________. (1981). Sharing the light of faith: An official commentary. Washington, DC: United States Catholic Conference. _____________. (1992). The Creed: The apostolic faith in contemporary theology. (Rev. ed. ).Mystic, CT: Twenty-Third Publications. _____________. (1995). The catechism yesterday and today: The evolution of a genre. Collegeville: Liturgical Press. _____________. (2000). Sowing seeds. Notes and comments on the General Directory for Catechesis. Washington, DC: United States Catholic Conference. Marthaler, B. (1965) The development of the episcopacy in the first two centuries. In T. Cranny (Ed. ), The episcopate and Christian unity (pp. 35-57). Peeksill, NY: Graymoor Press. __________. (1968). Henri de Lubac. In W.J. Boney and L. Molumby (Eds. ), The new day (pp.9-20). Richmond, VA: John Knox Press. __________. (1982). Foreword. In Barker, K., Religious education, catechesis, and freedom (pp. 1-5). Birmingham, AL: Religious Education Press. __________. (1983). The modern catechetical movement in Roman Catholicism: Issues and personalities. In M.Warren (Ed. ), Sourcebook for Modern Catechetics (pp. 275-289). Winona, MN: St. Mary's Press. __________. (1985) Introduction. In M.Warren (Ed. ), Sourcebook for modern catechetics (pp.13-20). Winona, MN: St. Mary's Press. __________. (1986). The synod and the universal catechism. In J. Provost and G. Alberigo (Eds.) Concilium. __________. (1986). Catechetical directory or catechism? Une question mal posée" In D. Lane (Ed. ), Religious education and the future (pp. 55-70). Dublin, Ireland: Columba Press. Abridged and reprinted in Church, 3 (Fall 1987): 45-50. __________. (1989). The catechism genre, past and present. In J.B. Metz and E. Schillebeechkx (Eds. ), World catechism or inculturation? Concilium 204, (pp. 41-49). Edinburgh: T. and T. Clark. __________. (1989). The creed and doctrine in catechesis for children. In K. Brown and F. Sokol (Eds. ), Issues in the Christian initiation of children: Catechesis and liturgy (pp. 65-74). Chicago: Liturgy Training Publications. __________. (1990). The parish life coordinator: Reflections from ecclesiology and church history. In M. Monette (Ed. ), Staffing tomorrow's parishes (pp. 33-48). Kansas City: Sheed and Ward. __________. (1990). The catechism seen as a whole. In T.J. Reese (Ed. ), The universal catechism reader: Reflections and responses (pp. 15-30). San Francisco: HarperCollins Publishers. __________. (1994). Does the catechism reflect a hierarchy of truths? In B. Marthaler (Ed. ), Introducing the Catechism of the Catholic Church (pp. 43-55) New York: Paulist Press. __________. (1997). Catechesis isn't just for children anymore. In P. Carey and E.C. Muller (Eds. ), Theological education in the Catholic tradition: Contemporary challenges (pp. 50-66). New York: Crossroad Publishing Company. __________. (1978). Socialization as a model for catechetics. In P. O'Hare (Ed. ), Foundations of Religious Education (pp. 64-92). New York: Paulist Press. Translated and reprinted as La Socialization comme modèle pour la catechèse" in Catechèse 83 (April 1983): 67-94). Marthaler, B. (Ed.). (1963). The Holy Eucharist and Christian unity. Report of the 43d Franciscan Educational Conference. Marthaler, B. (Ed.). (1964). The elements of Franciscan formation. Report of the 44th Franciscan Educational Conference. Marthaler, B. (Ed.). The Living Light, an Interdisciplinary Review of Catholic Religious Education, Catechesis and Pastoral Ministry. (Official publication of the Department of Education, United States Catholic Conference) Quarterly. Marthaler, B. (Ed.). The New Catholic Encyclopedia, Vol. 16, Supplement for years 1967-72. Marthaler, B. and Brooks, V.A. (Eds.). (1974). A study aid for basic teachings for Catholic religious education. United States Catholic Conference. Marthaler, B. and Sawicki, M. (Eds.). Catechesis: Realities and visions. A symposium on the catechesis of children and youth, United States Catholic Conference. Marthaler, B. (General Ed.). The New Catholic Encyclopedia. Vol. 18, Supplement for years 1978-1987. Marthaler, B. (Ed.). (1990-91).Come follow me. Basic Religion Series for Grades 1-8. Mission Hills, CA: Benziger Publishing Co. Revised ed., 1997. Marthaler, B. (Ed.). (1994). Introducing the catechism of the Catholic Church: Traditional themes and contemporary issues. New York: Paulist Press, 1994. Marthaler, B. (Executive Ed.). The New Catholic Encyclopedia. Vol. 19, Supplement for years 1988-1995. Marthaler, B. (Executive Ed.). (2001). The New Catholic Encyclopedia jubilee volume: The Wojtyla years. Farmington Hills, MI: Gale Group. Marthaler, B. (Executive Ed.). (2002). New Catholic Encyclopedia (Second Edition). 15 vols. Farmington Hills, MI: Gale Group, 2002. Marthaler, B. (1956). Some calendar statistics. Worship, 30, 470-472. __________. (1957). Original justice according to St. Bonaventure. Report of the Franciscan Educational Conference, 37, 166-175. __________. (1958). Forerunners of the Franciscans: The Waldenses. Franciscan Studies, 18, 132-142. __________. (1962). The Eucharist, bond of unityâ€”before the Council of Trent. Report of the Franciscan Educational Conference, 43, 241-254. __________. (1965). The councils in history: A survey of selected literature. Theological Studies, 26, 393-406. __________. (1965). Archeology and the rediscovery of scripture. Report of the Franciscan Education Conference, 45, 1-18. __________. (1966). The Luther image: History or interpretation? Homiletic and Pastoral Review, 66, 317-325. __________. (1966). The place of gospel miracles in the teaching of Christology. The Living Light, 3, 40-48. __________. (1968). Waiting for Godot vs. encounter with God. Front Line, 7, 116-129. __________. (1971). The renewal of catechesis in Italy. Religious Education, 66, 357-363. __________. (1971). Criteria for evaluating religious education textbooks. Evaluative Review of Religion Textbooks. United States Catholic Conference, 137-138. __________. (1971). Instrument for making the evaluation. Evaluative Review of Religion Textbooks. United States Catholic Conference, 140-150. __________. (1971). Infallibility at large. Cross Currents, 22, 481-486. __________. (1972, February). The General Catechetical Directory in perspective. Sisters Today, 317-328. __________. (1972). The new hermeneutic, language and religious education. American Ecclesiastical Review, 165, 73-83. __________. (1972). Check-up for religious education. Origins, (NC Documentary Service), 713-718. __________. (1973). The church's mission: Prophecy and catechesis. Religion Teacher's Journal, 7, 19-21. __________. (1973). Catechesis and theology. Proceedings of the Twenty-Eighth Annual Convention of the Catholic Theological Society of America, 28, 261-270. __________. (1973, October 26). Family planning: Silence is not catechesis. National Catholic Reporter, 9-10. __________. (1974). Total religious education: A blueprint for a learning society. The Living Light, 11, 266-293. __________. (1974). A traditional and necessary ingredient in religious education: Hagiography. The Living Light, 11, 580-591. __________. (1975, September 20) Catechisms revisited: New things and old. America. Marthaler, B. and Kauffman, B. (1975). An interdisciplinary approach to the teaching of college religion. NCEA newsletter. Marthaler, B. (1975). Joseph B. Collins (1897-1975). The Living Light, 12, 8-10. __________. (1976). Towards a revisionist model in catechetics (reflections on David Tracy's Blessed Rage for Order). The Living Light, 13, 458-69. __________. (1976). Religious education: A discipline in search of identity. Horizons 3, 203- 215. __________. (1976). To teach theology or to teach the faith. Proceedings of the Thirtieth Annual Convention of the Catholic Theological Society of America, 217-33. __________. (1977). What is the ministry of a DRE? A theological perspective. The Living Light, 14, 511-518. __________. (1977). Revisionist's amen. Religious Education, 72, 36-38. __________. (1977). The sounds of silence. New Catholic World, 220, 33. __________. (1977, August 11). Catechetical dimensions of Marriage Encounter. Origins 7, 129-135. __________. (1978). The modern catechetical movement in Roman Catholicism: Issues and personalities. Religious Education, 73. __________. (1978). Sharing the light of faith: New guidelines for Roman Catholic catechesis. Military Chaplain's Review, 83-93. __________. (1979). Between despair and complacency: Catholic religious education. Religious Education, 74, 33-38. __________. (1979). Evangelization and catechesis: Word, memory, witness. The Living Light, 16, 33-45. __________. (1980). Handing on the symbols of faith. Chicago Studies, 19, 21-33. __________. (1981). Planning an agenda for the eighties. New Catholic World. __________. (1981). The family in global perspective: Synod 1980. The Living Light, 18, 57-74. __________. (1981). New from France: 'Catechesis of documents'. The Living Light, 18, 24-33. __________. (1982). The professionalization and rights of the DRE. The Living Light, 19, 255-262. __________. (1984). The Cardinal and the catechism. The Living Light, 21, 32-42. __________. (1985). Interpreting the communion of saints. Liturgy, 5(2), 89-93. __________. (1987). A catechism of 'pro-trinitarian boldness'. The Living Light, 23, 243-252. __________. (1987). Grassroots ecumenism and religious education. Ecumenical Trends, 16 (4), 65-68. __________. (1987). A Book of Common Prayer for Roman Catholics? Worship 61(3), 208-223. __________. (1987). Dilemma for religious educators: Indoctrination or indifference. Religious Education, 82 (4), 555-568. __________. (1988). The unfinished synod of 1987. The Living Light, 24, 199-211. __________. (1988). A catechism sampler. Church, 4 (1), 48-54. __________. (1989). The Last Temptation of Christ revisited. The Living Light, 25, 342-348. __________. (1989). Key religious education books of the 1980s. Momentum, 20 (12), 12-13. __________. (1990, March 9). Old wine, old wineskins. Commonweal, 143-146. __________. (1990). The rise and decline of the CCD. Chicago Studies, 29, 3-15. __________. (1990). Is it time for a national catechetical office in the National Conference of Catholic Bishops? The Jurist, 50 (2), 553-572. __________. (1991). Catechesis as conversation. The Living Light, 27 (4), 309-317. __________. (1992). A pastoral on Catholic education. The process and the product. The Living Light, 28 (2), 101-113. __________. (1993). Europe under construction. A report from Brussels. The Living Light, 29 (2), 69-76. __________. (1993). The catechism of the Catholic Church. Church, 9, 34-36. __________. (1993). A religion club in the public high school? The Living Light, 29 (3),11-18. __________. (1993). Witnesses to the tradition giving flesh to doctrine. The Living Light, 29 (4), 61-70. __________. (1993). After the "what," what? Momentum, 24, 52-55. __________. (1993). The catechism of the Catholic Church in the U.S. context. The Living Light, 30 (1), 65-71. __________. (1994). Pluses and minuses of the index to the Catholic catechism. The Living Light, 31 (2), 65-70. __________. (1994). What's new about the new catechism? St. Anthony Messenger Press, 102, 28-33. __________. (1994). The catechism as confessional witness. Ecumenical Trends, 23, 1. __________. (1995). The gospel of life and the catechism: Points of convergence. The Living Light, 32 (1), 39-45. __________. (1996). Preparation for the year 2000: A "hermenuetical key". The Living Light, 32 (3), 12-18. __________. (1996). An "astonishing" petition: The catechism and forgiveness. Catechetical Sunday 1996: Called to Forgiveness, United States Catholic Conference, 42-43. __________. (1996). Teaching Christology through popular devotions. The Living Light, 33 (1), 61-69. __________. (1996). The development of curriculum from catechism to textbook. The Living Light, 33 (2), 6-20. __________. (1997). The faith of the church and its evangelizing mission. The Living Light, 34 (2), 6-7. __________. (1997). The catechism of the Catholic Church. The Presbyterian Outlook, 178 (15), 11-12. __________. (1998). Toward a catechesis on the Lord's Prayer: Frequently asked questions. The Living Light, 35 (1), 51-60. __________. (1999). The date of Easter, Anno Domini, and other calendar considerations: Chronology or eschatology. Worship, 73, 194-211. __________. (1999). A musical note: The twelve days of Christmas. The Living Light, 36 (2), 56-58. __________. (2002). In memoriam: Mary Charles Bryce, OSB. The Living Light, 38 (4), 68-72. New Catholic Encyclopedia (1967). s.vv., Abbo of Metz, Abraham of Clermont, Abraham of Ephesus, Abrunculus of Trier, Acharius of Noyon, Adalbald, Aemilian, Anianus of Chartres, Anianus of Orleans, Binius, Eisengrein (Martin and Wilhelm), Jonas of Bobbio, Ohleius (Johann), Pflug (Julius von), Rostock (Sebastian von). Corpus Dictionary of the Western Churches (1970), s.vv., Baltimore (Councils of), Basel (Council of), Constance (Council of), Conciliarism, Councils, Dollinger (Johann Josef Ognaz von), Great Schism, Lateran Councils, Pisa (Council of), Pistoia (Synod of), Trent (Council of), Vatican Councils, Vienne (Council of). Catholic Encyclopedia Dictionary (1970), s.vv., Celibacy (Clerical), Eucharist. New Catholic Encyclopedia Vol. 16 (1974), s.v., Catechetical Directories, p. 53; Vol. 17 (1979), s.v., Religious Education, p. 566c; Vol. 18 (1988), s.v., Filioque in Ecumenical dialogue. Graduate Programs in the Humanities and Social Sciences 1985 (Princeton, NJ: Peterson's Guides, 1985), s.v., Religious Education, p. 686. Dizionario di Catechetica, edited by J. Gavaert. Torino, Italy: Editrice Elle Di Ci, 1986., s.vv. Catechetics (USA), Confraternity of Christian Doctrine (USA). pp. 172-73, DRE (Director of Religious Education), p. 218, Religious Education Association, pp. 541-42, Religious Education (USA), pp. 542-43. New Dictionary of Theology, edited by J.A. Komonchak, Mary Collins, and Dermot Lane (Wilmington, DE: Michael Glazier, Inc., 1987). s.v., Creeds, pp. 259-264. Harper's Dictionary of Religious Education (San Francisco: Harper and Row, 1990), s.vv., Catechetical School, Catechism (both RC and Protestant), Clement of Alexandria, History of Christian Education: Medieval Period. New Catholic Encyclopedia, vol. 19, s.vv. Perkins, Mary Ryan, World Youth Day, Stuhlmueller, Carroll. Encyclopedia of American Catholic History (Collegeville, Minn.: Liturgical Press, 1997), s.v. Baltimore Catechism, The. Religion in Geschichte und Gegenwart, fourth edition (Tubingen: Mohr, 1999), s.v. Credo, im Gottesdienst I.
Socialization as a model for catechetics. In P. O'Hare (Ed.) Foundations of Religious Education (pp. 64-66, 73, 77). A common confession of faith in the triune God will be the means and sign of reconciliation of Christians with one another. Although a divided Christendom may not yet be ready to agree on the doctrinal implications of every phrase and strophe in the traditional Creed, Christians more and more are praying it together. The Creed in origin and purpose is a doxology that acclaims God's glory, a confession of praise and thanksgiving for all that God has done for us and our salvation. To this synopsis of the story of salvation proclaimed in the Scriptures, Christians can but respond with a grateful "Amen" (The Creed: The Apostolic Faith in Contemporary Theology, p. 427). The way one defines the discipline [of religious education] has practical ramifications in every area. It affects one's visions as well as one's strategies for religious education at the local level. It shapes the design of the graduate programs in which the professionals in the field are trained. It defines the relationship of religious education to other disciplinesâ€” theology, liturgics, the social sciences, education, and so forth…It is the purpose of this paper…to sketch a model that will elucidate the nature of religious education and provide a basis for interdisciplinary discourse…It is my contention that a socialization model is useful for explaining and interpreting many of the varied activities that are carried on in the name of religious education. The Christian community believes it has a message of lasting importance. Like every group that takes itself seriously, Christians believe they have a mission to transmit this message to successive generations. Or in the language of socialization, the Christian community believes it has a responsibility to impress its institutional meanings and values powerfully and unforgettably on its members. (1973) Catechetics in context: Notes and commentary on the General Catechetical Directory issued by the Sacred Congregation for the Clergy. Huntington, IN: Our Sunday Visitor. (1978). Socialization as a model for catechetics. In P. O'Hare (Ed. ), Foundations of Religious Education (pp. 64-92). New York: Paulist Press. (1992). The Creed: The apostolic faith in contemporary theology. (Rev. ed.). Mystic, CT: Twenty-Third Publications. (1994). Introducing the catechism of the Catholic Church: Traditional themes and contemporary issues. New York: Paulist Press. (1995). The catechism yesterday and today: The evolution of a genre. Collegeville: Liturgical Press. (1997). Catechesis isn't just for children anymore. In P. Carey and E.C. Muller (Eds. ), Theological education in the Catholic tradition: Contemporary challenges (pp. 50-66). New York: Crossroad Publishing Company. Susan Willhauck, Ph.D. The Catholic University of America (Studied with Berard Marthaler 1983-1992). Dissertation on John Wesley's View of Childhood: Foundations for Contemporary Christian Education. Assistant Professor of Christian Formation and Teaching at Wesley Theological Seminary, Washington, D.C. Author of "Children as Little Adults: Philippe Aries Revisited," in The Living Light (Summer 1992). Co-author of The Web of Women's Leadership: Recasting Congregational Ministry. Abingdon Press, January 2001.